I almost forgot how much I love this game. It would be nice if there was an updated version for Windows 10. But the gameplay is still awesome. For those of you having trouble with playing, and even cut scenes, try installing it in compatibility mode for Windows 95. That′s what I did. And have had no problems. But don′t forget that this game is really low resolution, compared to today′s standards. Setting your display to the lowest resolution (600x800) may help. Hi guys I just want to say that this is the first time I have seen it and thank you for putting this up on Internet. 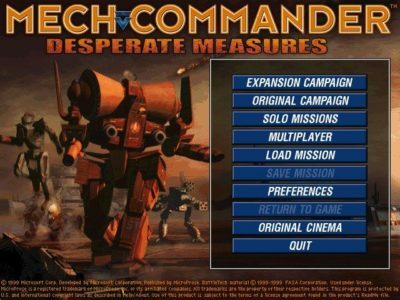 I run the Mechcommander.co.uk website so if you have any problems getting this game to run you should definitely head on over to our forums for technical support. Hope you enjoy this game as much as we do and your welcome to head on over to gameranger and play with us online! Loved playing this game when it first came out. One of my favorite games ever. played this game when it first came out. was leader of the Grey death Legion online. one of my favourite games ever. anyone know how to get the cut scenes to work on windows 10? the game itself plays fine but the cinematics arent playing. As a Gen-Xer who used to wait DESPERATELY for an 8MB demo of "TERMINAL VELOCITY" to download for about .. . . eh, 1.5 hours w/ a 56k modem, this site rocks along w/ the realities of DSL. You younger newbies DO NO NOT KNOW THE PAIN of surfing the ′94 Internet on a 14.4k modem! This is a classic RTS. In order to play you will need to use a win95 emulator. Downloads fine. Play right from mount ISO, installation not allowed on Win10 x64. Loads fine, but crashes as soon as you press "begin mission" on the first campaign mission. A very fun tactical RTS with beautifully detailed sprites and a nice long campaign to keep you hooked. Persistent mechs, salvage, crews, and weapons just add to the already enjoyable experience. One of the best games I have ever played .. thank you for the download ..
One of my favorite RTS games. Gotta get the Hollander II and MadCat at the start! Cutscenes aren′t working on my end and the patch the game comes with doesn′t seem to work, Windows 7. Share your gamer memories, help others to run the game or comment anything you′d like. If you have trouble to run Mech Commander: Gold (Windows) first!